Automated People Mover Systems (APM) use dedicated (elevated) guideways to facilitate direct, high capacity connections along a corridor. Where traditional APM systems use large vehicles at low frequencies, 2getthere employs 24-passenger GRT vehicles at high frequencies. The system accommodates capacities in excess of 5,000 passengers per hour per direction. With a maximum speed of 60km/hr, the system is suited to serve both short connections (up to 1.5 kilometer) as well as long corridors (e.g. 12 kilometers). 2getthere’s Automated People Mover Systems cost 50% to 75% of traditional systems. The actual difference depends on the required capacity and the length of the connection. This cost advantage directly results from the lack of rail, the reduced infrastructure costs and the increased flexibility. The off-line stations allow express connections between major attractors to be established. In addition the service level is higher (and hence the possible revenues), resulting in a more attractive business case. Automated People Mover Systems are common at the world’s major airports. The lower costs make 2getthere’s APM systems suited for smaller airports as well. The systems are also suited for urban applications, both for point-to-point connections as well as corridors. This is especially the case when initial demand is relatively low and growing over time, or in case of significant deviations in demand between the various hours of operations. The smaller vehicles and flexibility allows for networks to be realized. We look forward to contributing to the Smart Cities Summit Asia in Seoul and sharing our experience with autonomous shuttle since 1997. Smart Cities Summit Asia is Asia's leading exhibition and conference for smart city technologies where companies and delegations form over 200 cities gather to build people centered smart cities together. This event is focused on city government and infrastructure oriented as MOLIT (Ministry of Land, Infrastructure and Transportation) is hosting the event. For the conference, The Dutch embassy in Korea is organizing a Smart City trade mission. 2getthere is a speaker in mobility session and will be present at the Holland pavilion to meet potential customers and partners in Korea. The Masdar Personal Rapid Transit (PRT) system in Abu Dhabi, UAE, this morning successfully reached the 2 million passenger mark since it was launched on 28 November, 2010. Over the years a wealth of data has been collected from the system which has been used to further the development of autonomous vehicles, both in relation to the technology as well as user interaction. Just a week before its seventh anniversary, Miss Geethma Devangee, a student from Merryland School Abu Dhabi, became the 2 millionth passenger. Geethma was visiting Masdar City on an educational field trip. As the lucky winner she was presented with a dining voucher to be redeemed at any restaurant in Masdar City, as well as a certificate to mark the honour. The PRT system at Masdar City welcomed its 1 millionth passenger in May 2014, and has now carried another million in the short time since, accounting for a staggering 75% increase in passenger numbers. The system is currently carrying five times the anticipated amount of passengers, achieving close to 90% average occupancy rates during weekends. The data collected from the PRT system has been invaluable, according to Carel van Helsdingen, CEO of 2getthere. He said: “Real-life applications are invaluable for the reliability of the resulting information. Where a demonstration only provides an indication of the way passengers interface with a system, a real-life application shows real-world behaviour. The Masdar City PRT system benefits from dynamic safety features, resulting in zero accidents or collisions since launch. System availability and vehicle reliability have also consistently achieved success rates of 99.6% and 99.9% respectively. Phase 1A of the Masdar PRT pilot project is approximately 1.4 kilometers long and features two stations: the North Car Park and the Masdar Institute for Science and Technology. 2getthere plans to expand this network across more sites across the City, as well as introduce a General Rapid Transit (GRT) system in the near future. [one_half]On August 17th India PM (Prime Minister) Modi visited Masdar City in Abu Dhabi, kicking off the visit by riding the PRT system supplied by 2getthere. For purpose of the visit the service of the PRT system had been reserved exclusively for the large delegation travelling with the Prime Minister. As the Prime Minister left the station, journalists where seen rushing through the station to use one of the other vehicles available at the berths. In their pursuit of not missing a single minute of the visit, the floor of the vehicles was creatively used for additional seats as standing is not possible. With the payload of the vehicles not being exceeded, the control room operators decided to allow the transit to proceed although monitoring the passengers continuously over the CCTV system. 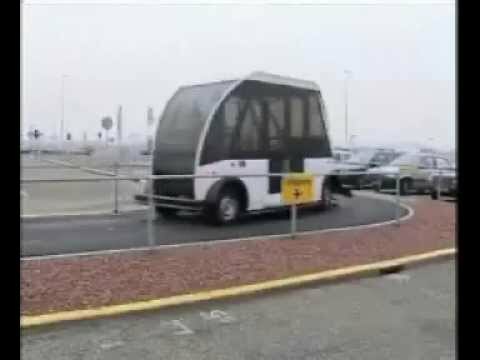 NDTV.com reported that ‘The highlight of the PM’s tour was a demo ride in a self-driving car, part of Masdar city’s Private Rapid Transit or PRT. The car runs on lithium batteries powered by solar energy and uses a virtual software to guide its journey. An enthusiastic crowd of Indians gathered in Masdar to watch the PM’s ride; PM Modi was seen waving at the crowd.’ Link: http://www.ndtv.com/india-news/pm-modi-rides-self-driving-car-in-masdar-worlds-first-zero-carbon-city-1208011. The Prime Minister himself tweeted on his experience, sharing some photos in the process (https://twitter.com/PMOIndia/status/633138811728478208). The message was retweeted nearly 500 times and favorited over 900 times. At the same time UAE news outlets also reported extensively on the visit: http://www.thenational.ae/uae/government/modi-in-uae-indian-pm-takes-a-tour-of-masdar-city. 2getthere continuous to be honored by being able to transport the dignitaries visiting Masdar City with our PRT system.